I've been intrigued with the concept of oil pulling ever since I first heard about it, which was probably years ago now. But let's be honest, the thought of swishing coconut oil around in my mouth everyday didn't sound all that appealing. I like coconut in things, like cookies, but straight up coconut oil? Just no. 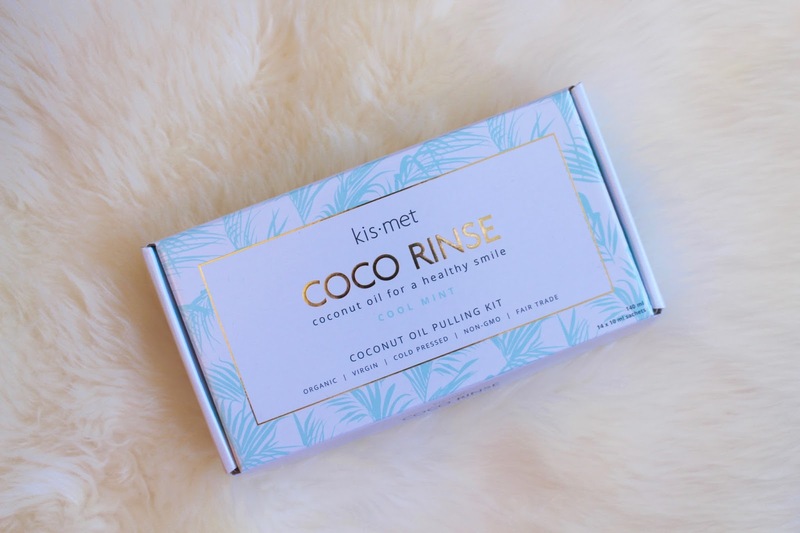 When Kismet Essentials reached out to me to try their 14-Day Organic Coconut Oil Pulling Kit I agreed as soon as I found out they flavour their oil with mint! I love mint flavoured things! Of course, mint chocolate is my absolute favourite, but that's probably asking too much here. The other reason I decided it was time to give oil pulling a try is because I'm pregnant. I don't know about any of you women out there who have been pregnant (or are pregnant), but brushing and flossing your teeth, especially in that first trimester, is brutal. I could not brush my teeth without gagging and flossing was out of the question. But I know how important good oral hygiene is, especially when you are pregnant, since you are more prone to pregnancy gingivitis during this time. I figured I needed all the help I could get since teeth brushing is not at it's best during those first several months of pregnancy. Coconut oil pulling is said to give you the best results if done in the morning. And it's suggested that you swirl the oil in your mouth for 10-20 minutes, followed by brushing and flossing your teeth. I was so worried that I would gag doing this in the morning, but honestly, I didn't gag once! And while I don't get up early enough to oil pull before my toddler gets up, it was kind of nice to oil pull while getting our breakfasts made in the morning. He thought it was hilarious that I could only answer him with "hmms" and mumbles! 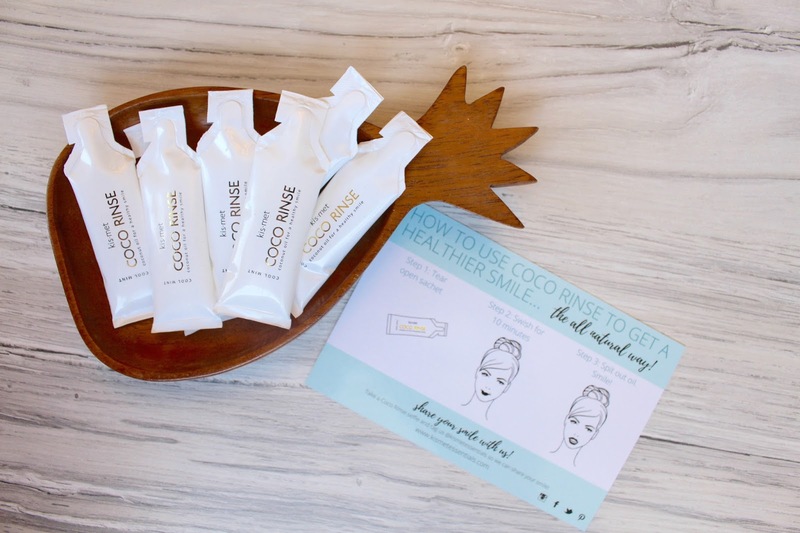 Kismet Essentials Coco Rinse is made up of 100% raw, organic, virgin, cold-pressed, non-GMO coconut oil and organic peppermint flavouring, making it completely safe to use while pregnant. And if you're one of those odd people who isn't a fan of peppermint, I assure you, the flavour is not overpowering at all, it's very subtle and just adds a little freshness to otherwise plain coconut oil. 1. Start small. 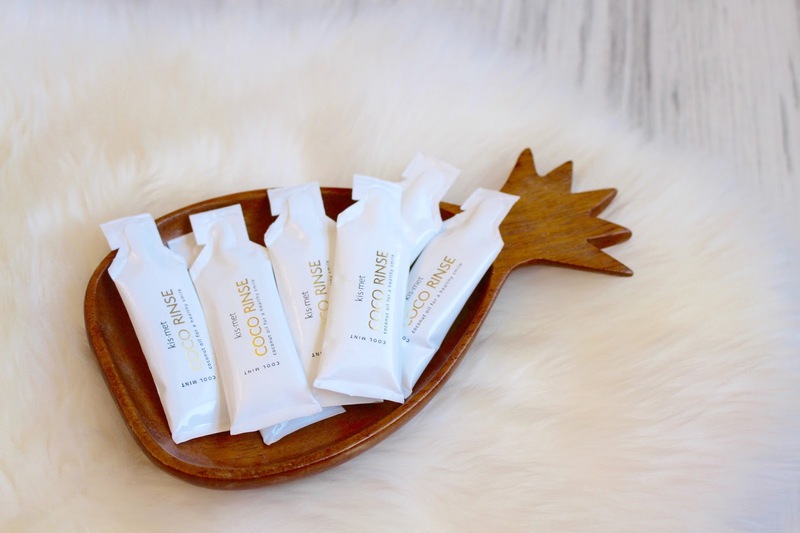 I find my mouth creates a lot of saliva while oil pulling and there is no way I could put the entire pouch of coconut oil in my mouth and swish it for the whole 20 minutes. So I split it up. I would do half the packet for 10 minutes, spit out, then put the remainder in for another ten minutes. I found this way, it was also easier to do the full 20 minutes. 2. Overtime, spitting of the coconut oil into your sink could cause a buildup of coconut oil in your drain so always spit into the garbage or a disposable cup. I almost always had a take-out coffee cup from the previous day that I would save to spit into. (This is also a great way to oil pull while driving, which I did once when I had to drive my husband to the airport really earning one morning). 3. Don't "gargle". Oil pulling is meant to be a gentle swishing of the oil through your teeth and in your mouth. Gargling will definitely make your jaw sore before even 10 minutes is up. 4. The oil melts quickly in your mouth, so I don't feel it's necessary to warm the packet up, but if you don't like the sensation of it melting in your mouth, then holding the packet in your hands for a few moments will melt the oil. 5. 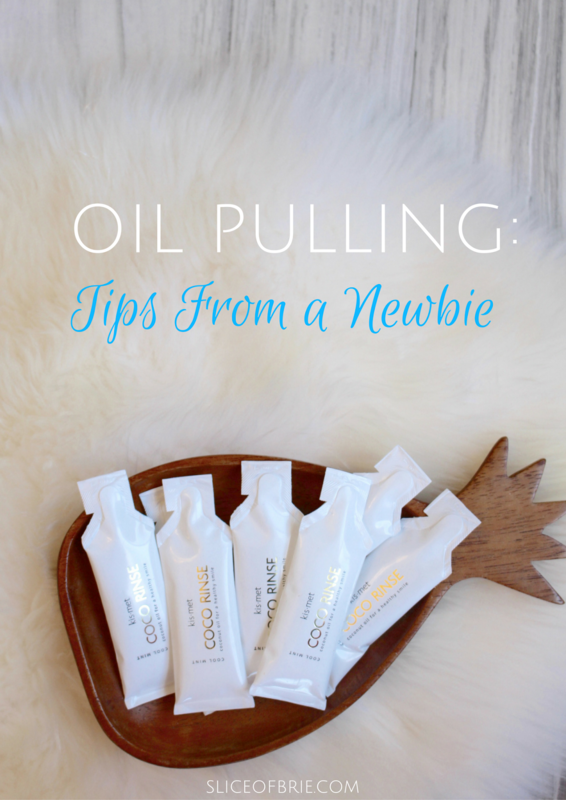 To make oil pulling a habit, keep your oil packets somewhere handy and in sight. I found keeping mine in the kitchen was the best visual reminder for me. As soon as I walked downstairs, I opened a package and got to work. I thought it would be hard to keep this up every single morning, but I found myself looking forward to it! And if oil pulling in the morning is absolutely not something you can do, then I would find a time of day that works best for you! 6. When you're done, brush (and floss) and enjoy your cleaner and healthier feeling mouth! Seriously, my teeth felt so clean during the day and my breath was noticeably better. I've recently been to the dentist and while I have no cavities, I do have a few spots the dentist made note of that he will be keeping on eye on. It will be interesting to keep up with oil pulling and see how my teeth are doing when I go back for a checkup in 6 months. I think two weeks is too short to say if I noticed any difference in the colour of my teeth, but like I said above, I definitely noticed a difference in how clean my mouth felt and my breath. By the end of the day, if I haven't brushed my teeth since morning, my teeth feel pretty gross, but I noticed that with oil pulling, my teeth felt much cleaner when I ran my tongue over them. I was also pleasantly pleased with how fresh my mouth and breath felt throughout the day. In fact, sometimes after I was done oil pulling in the morning, my mouth would feel so fresh that I would almost forget to run back upstairs and brush my teeth! And if you want to give this oil pulling thing a try, you can use code SLICEOFBRIE to receive 15% off of your order! Have you ever tried oil pulling? Thoughts? 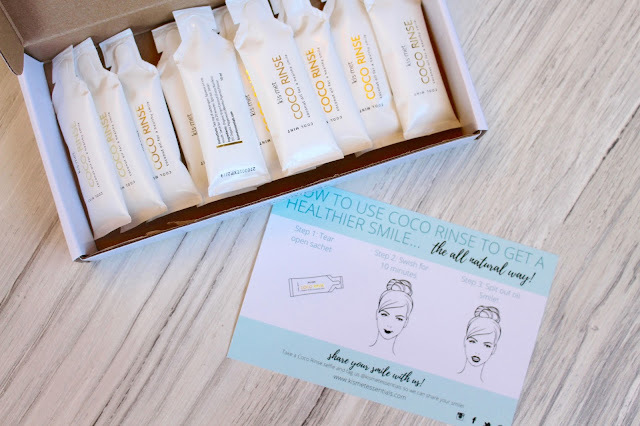 *I was provided with a 14-Day Cool Mint Oil Pulling Kit from Kismet Essentials in exchange for this blog post. As always, all opinions and reviews expressed are my own. Thank you for supporting the companies that make this hobby of mine possible!